The Ebola panic has died down; while many are under monitoring, there have been no further de novo U.S. cases since October 15, and only two more “imported” cases. Travelers are being screened and resources are heading to areas where they are needed. At my institution, Hospitalists have led the way; over half my division volunteered up-front to provide necessary care. I ended up in a lot of planning and policy meetings, where we internally crafted a comprehensive plan to deal with any Ebola-related eventuality. Nationally, the Centers for Disease Control and Prevention (CDC) have created many useful resources for people and institutions needing them. We now have guidelines for speaking to our children about Ebola and for taking care of Ebola-exposed pets, in addition to more trenchant issues. We now have “Ebola centers,” hospitals capable of caring for suspected or confirmed Ebola patients with CDC support. Despite all the now available resources and guidelines, there’s one thing still lacking, and that is clear guidance about the ethics of Ebola. Ebola virus disease (EVD) in the US is a different beast than that rampaging in West Africa. We can expect our patients to survive–so far. Some have been ventilated and some have been dialyzed, but most have survived. American EVD patients have been pretty healthy, pretty young, and all but one were medical people–just like us, presumably. However, we’re talking about a disease with a mortality of 80% or so in some settings, spread by contact with fluids, including aerosols, and the viral burden rises as patients get sicker. How can we best care for patients and still protect staff? Should we limit what we do? Patients who die of EVD are unequivocally the most infectious. There is probably no setting where a healthcare worker has a higher risk of splash, splatter, or aerosol exposure than during CPR. 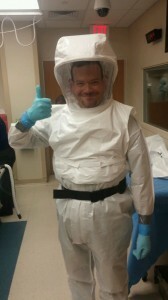 And for how long can one provide good chest compressions in a TyVek suit? What about the curious ethics of a universally-applied procedure with an 80% or higher failure rate? Every clinician I’ve asked –approaching 100 nurses and physicians at this point — agree that “no CPR” is appropriate for EVD patients. – No provider should provide medical care to suspected or confirmed EVD patients without full, carefully donned PPE. – Early intubation is reasonable; emergent intubation for abrupt acute respiratory failure or respiratory arrest is high risk and may not be offered. – Cardioversion and/or antidysrhythmic medications are reasonable; chest compressions are not. – No emergency procedures in an uncontrolled setting. – Surgery and other invasive procedures for acutely ill EVD patients should not be offered. Trauma cases and early or convalescent cases can only be addressed on a case-by-case basis, but in general should not be offered. – Dialysis should be addressed on a case-by-case basis. – Age does not make one an exception. This is happening every day in Africa. I hope it doesn’t come up here. I really hope that it doesn’t happen to a kid here. But it could, and it behooves us to think about ethics early, and codify them if we can. Dr. Bart Caponi MD, FHM graduated from the University of Illinois at Rockford College of Medicine in 2005 and completed his internal medicine residency at the University of Wisconsin in 2008. He has been practicing hospital medicine at the University of Wisconsin since then. In 2012, Bart became a utilization review advisor, and is primarily responsible for provider education and policy interpretation.